The Gleim FAA Test Prep is a unique, easy-to-use program that enables you to study and pass your FAA knowledge test (written exam). The Gleim FAA Test Prep Software contains all of the same study outlines and figures that are in the Gleim FAA Knowledge Test books while also enhancing your learning experience by providing customized study and test sessions in both the Gleim format and the major computer-testing vendors' formats. Please note: the Gleim Test Prep courses only contain the study questions for fixed wing powered airplanes. If you are practicing for a rotocraft, glider, or LTA test, we recommend that you take a look at the ASA PrepWare. The PrepWare courses contain the questions and answers for all the different ratings. Also note that this is an ONLINE exam only. It cannot be used offline. If you want software that you can download and install for offline use, we recommend the ASA PrepWare. Compatible on all operating systems and mobile devices or tablets with an Internet connection. Once the license code has been emailed, we are unable to cancel or refund for this software. Review: Once they sent me the download package, everything was superb. I had to Email them to let them know that I had not received my download packet. Review: Not as easy to use as the ASA Prepware - too many menus to wade through. Review: But you can only use on one computer, save all paperwork. You will pass your FAA exam. Pros: The software has all the FAA questions in it. Review: One has to work at learning flying however, the Gleim Sport Sport Pilot CD has been Awesome! I could go now and make a 90 or better on the exam. But With a little more work, I'll Ace it! Reading a book is one way to do it. Even the Gleim books are good. But I recommend the CD method. Videos are too slow. Go with the CD's. I'd like to meet the Gleim people... they are brilliant! Pros: Almost exactly the same as actual FAA Test. Great practice tool. Review: After ground school I wanted to run some sample tests. My actual overall FAA test score was considerably higher than my first practice test. Sample tests are almost exactly like the FAA test which made me a lot more confident going in. Practice and Study sessions help shore up your weak ares Runs both CADS and Laser Guide formats. Well worth the money! Review: Was frustrating that it asks questions about IFR flight and LSA pilots can only fly VFR. I like the study sessions for learning because I can get instant feedback when the dreaded red X shows up. I use a small laptop and the charts-METAR and navigation reference materials in the test are very hard to read because they are so small even when zooming in on them. Pros: Gleim site provides updates as question pool changes. Review: Excellent study aid. I studied material for 2 weeks and aced the exam. Software structured to make up study plans for ares of weakness. A no-brainer. If you want to pass your exam in a hurry, tou should serioulsy consider this software. Cons: there's not enough contrast on the pages for someone with a small laptop. Cons: You can only install the software once on your computer. Need to call vendor if you need to re-install. Q: Will it work on ipads with 128meg mem.? A: The software is all online so yes, you can use your iPad. Q: does it work on apples? A: No it does not. You may be interested in the ASA Sport Pilot PrepWare which will work on a Mac. 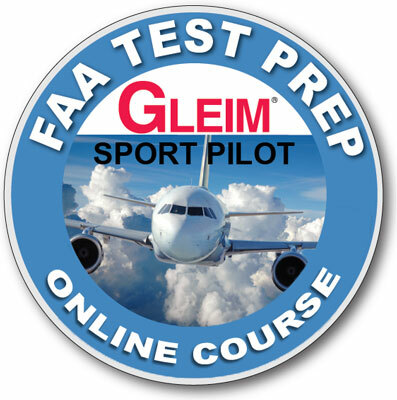 Q: I cannot find any reference on the Gleim web site that states the Gleim Sport Knowledge Test Software (your product code 2835) provide the student the sign-off which allow them to take the written FAA test. How can I be sure this software provide the student sign off is this a money back gurantee if the software does not provide the necessary sign off? A: After installing the software, click the "Performance" menu and then "Instructor Sign-Off Forms". If you have successfully answered all of the questions at least once, select Print from the sign-off screen's toolbar to print the form. Take the sign-off to your computer test site as authorization to take your test. It does NOT have to be signed by Dr. Gleim or anyone else. To prepare flight students pursuing their sport pilot certificate. Sport Pilot Syllabus is a step-by-step lesson plan for your sport pilot training.